I cannot put into words how excited I am to share this post with you all. I have mentioned little bits and pieces of what I do for my job here in Starkville. However, what I have not ever mentioned on my blog is anything about the AMAZING people that I get the privilege of working with. Not only are these people my "co-workers", but they have become our church family and closest friends. With this being said, I am overjoyed to introduce you all to some of our closest friends here in Starkville, the Ragans. Kaylee and Colton Ragan have become dear friends of ours and are members of our church, as well as co-workers in ministry with me. This family has the biggest heart for spreading the Gospel and making the name of Jesus known. They are new-ish parents to one adorable little boy, and the Lord has now called them to the journey of domestic adoption. Part of my "mission statement" for this blog is that I will strive to affirm and encourage others in their relationship with Jesus Christ. So today I am allowing you to meet some of our dear friends, hear some of their story, and give to their adoption if the Lord calls you to. We love this precious family! They have been friends to Ben and I since we were engaged; they welcomed us into their home during that season and have loved us so well. Kaylee and Colton lived in the apartment we live in before we did; they are the ones who introduced us to our sweet first home! They were some of our first friends to have a baby, and it was so incredible for us to watch Kaylee and Colton become new parents to sweet baby Collins. We love Collins too! :) Can't wait to be those old folks one day that tell him we were there the day he was born! So special! So let me tell you a little bit more about this family. Kaylee and Colton love Jesus, and they love people. Anyone that knows this couple will tell you that they love people intentionally, deeply, and with all that they are. The Ragans radiate Jesus Christ to all they interact with, and that is such a sweet thing to witness. Kaylee and Colton desire to see the Gospel proclaimed in all the Earth, and this year they have felt that this means domestic adoption for their family of 3. I have been longing to write this post and share this family and their heart with you! Below is a short video of Kaylee and Colton (and Collins and Millie, their pup) talking about this journey and how you can help! I would love if you watched this and helped this family in some way. Their homestudy has been complete, and now they must raise the money necessary to fund the adoption before they can be matched with a family. Would you be willing to help this amazing family bring baby Ragan home? Ragan Family Adoption from Cody McCain on Vimeo. I was so privileged to get to put my little tidbits of Photoshop knowledge to good use in designing the logo for the Ragan family, and they turned it into a puzzle like Kaylee explained in the video. So how can you help fund their adoption? Buy a puzzle piece...for just$25, and your name will be written on the back as a constant reminder of the love of brothers and sisters in Christ. Just click the link below, and to give you can click on the gray box at the bottom of the page, OR by clicking the orange "donate to our team fund"...the most important thing is just make sure you specify to give to the Ragans specifically! What a wonderful way to show baby Ragan a physical picture of the body of Christ coming together. The best part of the body of Christ is that we are family, whether we know each other or not...whether we meet each other this side of heaven or not, we who claim to follow Christ are part of the body, and this is an opportunity to meet a need for members of the body! Let's show the love of the body to this wonderful family! CLICK TO GIVE TO RAGAN FAMILY ADOPTION! You can follow Kaylee and Colton on Instagram or Facebook for updates on their progress! We love you Ragan clan and are so privileged to call you dear friends and family in Christ Jesus! 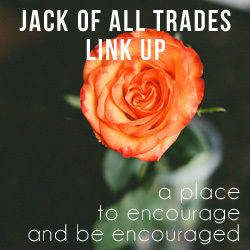 Also, I am co-hosting the Jack of All Trades Link Up today! Come join us for some great fellowship and an opportunity to meet some fabulous other bloggers! Link back to this post so we can grow this blogging community, you can use the button below if you like. Instagram Recap + Good for the Soul GIVEAWAY!